Mobile note-taking apps are a dime a dozen these days; iOS has one baked in, and so does practically every flavor of Android. Then there are heavy hitters like Evernote, Microsoft’s OneNote and Google Keep. So why look at another one of them? Everyone’s note-taking needs and styles are different, and there probably isn’t a single app that satisfies them all. To that end, I was pleasantly surprised to see productivity software maker Zoho take a crack at this with its new Notebook app for iOS and Android. Notebook is drop-dead gorgeous, with a simple interface and a visual organization system that lets you choose covers for your various notebooks and group related notes into stacks. It offers different note types for text, checklists, audio and photos; you can also add all this into a single note and even format your text as you like. And the ability to group notes by throwing them into a pile feels more intuitive than adding tags and labels. But is it for you? That depends on how you plan to use your notes. If you’re looking for a way to save content from the Web, as well as receipts and business cards, you’ll be better off with Evernote and its rich feature set. However, if you just want a free app that syncs across your mobile devices and keeps things simple, you could do a whole lot worse than Notebook. 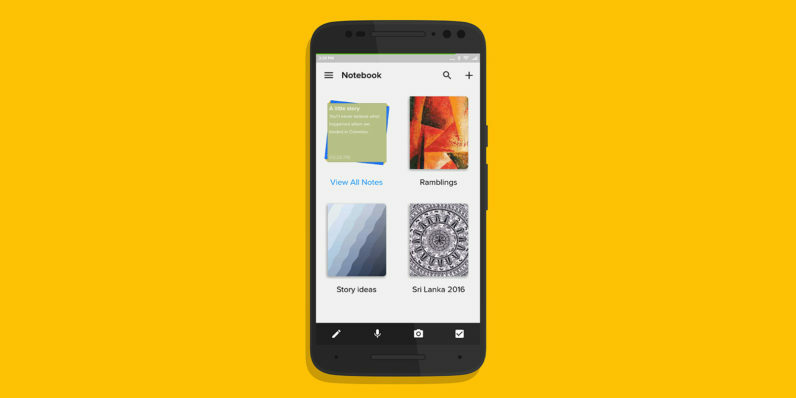 Zoho compares its app to Evernote, but it really is a lot closer in comparison to Google Keep – and even then, Notebook loses out in terms of features. The app compares It still lacks a few features that I find essential nowadays, such as a Web app so I can create to-do lists from my desktop, and a decent widget that lets me view notes without launching the app. You can try Zoho Notebook right now by downloading it from Google Play or the App Store.